The United States Agency for International Development (USAID) is collaborating with African countries to explore opportunities to help them achieve Universal Health Coverage (UHC) in the sub-Region. It, therefore, opened a three-day workshop on the African Collaborative for Health Financing Solutions (ACS) project in Accra on Tuesday, which is being attended by more than 50 delegates from countries including Ghana, Benin, Burkina-Faso, Nigeria, Senegal, Tanzania and Uganda. Its focus is to identify implementation and health systems challenges financing as well as knowledge gaps in the bid to achieve the UHC. Participants would benefit from the given platform to share their respective country experiences and exchange knowledge on financing innovations being piloted or scaled to improve efficiency, equity, and sustainability of health system financing. Ms Carrell Laurent, the Acting Missions Director for USAID, West Africa, in her opening remarks, said the workshop reflected the Agency's commitment to supporting the Region, not only financially but through technical expertise and fostering relationships between United States and local experts as well as policy makers. She said by working together, each of the countries could be more cost-effective and leverage each other's approaches to ensure an eventual translation of UHC into accessible health care across the Region. Ms Laurent said the ACS was a five-year USAID-funded project that worked with regional bodies and country-level multi-stakeholder platforms to share knowledge, strengthen accountability and promote health financing policies and processes that advanced UHC in the sub-Saharan African Region. The West Africa Regional Mission, she said, was about applying 'African Solutions to African Problems,' which the USAID did by supporting regional institutions like the West African Health Organisation (WAHO) and local governments as well as other partners to fully realise their mandates and goals. Ms Laurent indicated that health systems strengthening, including financing, had been at the core of the USAID West Africa Mission's strategic objective in health for many years, which was evident in its huge investments to guarantee the sustainability of the life-saving impact of all its global health programmes. 'Our overarching vision is to achieve four strategic outcomes that together improve protection and access to high-quality services for underserved, marginalised, and high-priority groups,' she said. She said the strategic outcomes of the USAID's Vision include ensuring financial protection so that the cost of essential health services permitted people to use necessary services without impoverishing themselves. This includes essential services so that the package of high-quality prevention, promotion, treatment, and care were made available to all. The strategy, she said, further safeguarded quality health services delivered in a timely and confidential manner that ensured dignity and respect for each client. Ms Laurent said in the area of financial protection, the USAID helped to ensure that the cost of health services neither kept people from using necessary services nor impoverished them, and that health systems were able to reach everyone, especially the poor, underserved, marginalised and vulnerable. The USAID also provides growth assistance to help partners on their own development journey to self-reliance, looked at ways to improve lives and build communities, and partner with countries to provide sustained, equitable access to essential, high-quality health services and protecting poor and underserved people from extreme poverty, illness, and even death. Ms Laurent said she was impressed by the systematic manner in which the ACS project had initiated its work, starting with consultations in five countries and formulating this workshop to inform future activities based on their common goals as well as unique country demands. Ms Kelley Allison, the Project Director for the African Collaborative for Health Financing Solutions, said a huge amount of very good work had been done to develop and put in place sound policies and strategies to move UHC forward. However 'it is clear that technical solutions alone would not get us there, supporting countries to develop other non-technical skills like communication, engagement and facilitation will help the UHC to make progress,' she said. Giving a brief background, she said the ACS started in the mid 2017 with a deep consultation phase in five sub-Saharan African countries to understand some of the operational challenges that were being experienced by the health sector. The present workshop, she explained, would share the lessons so far learnt and use those results to decide the support needed to overcome the challenges. Ms Megan Rhodes, USAID Representative from Washington D.C, urged participants to share knowledge on their respective country commitments to improve health financing and quality healthcare, and to discuss how to identify the common challenges and opportunities across the continent. 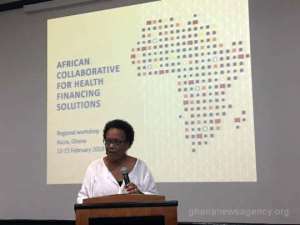 She said the workshop would bind countries and regional institutions to work together to help one another to reach their health financing goals in a manner that would increase local ownership and reduce dependency and external support.